If you are anything like me, you have a Pinterest board full of beautiful, well curated and designed homes. After about an hour of getting sucked into Pinterest, I usually have 5 or more things to add to my "home goals" list. One of my favorite things these days is decorating our home, painting, and switching things up to be a home that my husband and I love to live in and have friends enjoy as well. Looking at my Pinterest board of favorite interiors can make the design seem so unattainable since I don't have an overflowing bank account just for decorating my home. I know our style will always be evolving and it is no where close to finished but I have a few insights of how to make your home a place you love to be in without having a huge budget for it. Because if we are honest, there are other things in life vying for your finances! 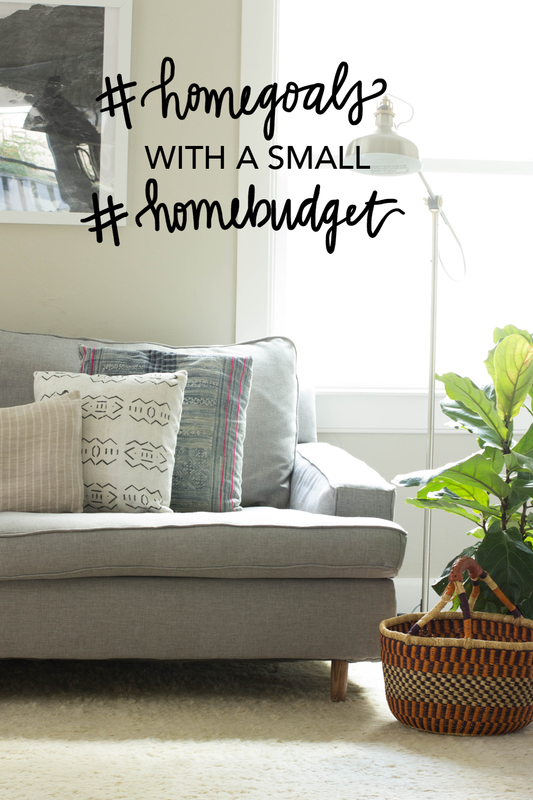 Here some tips you can do to reach your #homegoals with a small #homebudget. Be sure to read below, I've asked a few blog friends to add their two cents in the matter! 1. Improvise for a season. Your dream home will not happen over night! And honestly, I think that is the fun part (or I try to remind myself that)! So if you have a rug that you really dislike (me, currently) but can't fork out the chunk of change for a beautiful persian rug or haven't had the luck to find one for $10 at a flea market, do what you can to cover it and draw the attention elsewhere! Improvise, but don't settle. I think there are things you have to come to grips with that will take longer to achieve than others and once you find that dream piece for your living room, you'll be glad you waited! This is my motto in life. Our bed, couch, coffee table, leather pouf, photos on the walls, fruit basket, and countless other things in our home are DIY's. This not only makes your home more personal, but helps you achieve what you want for a fraction of the price. Now if I could only learn how to make the perfect persian rug…. 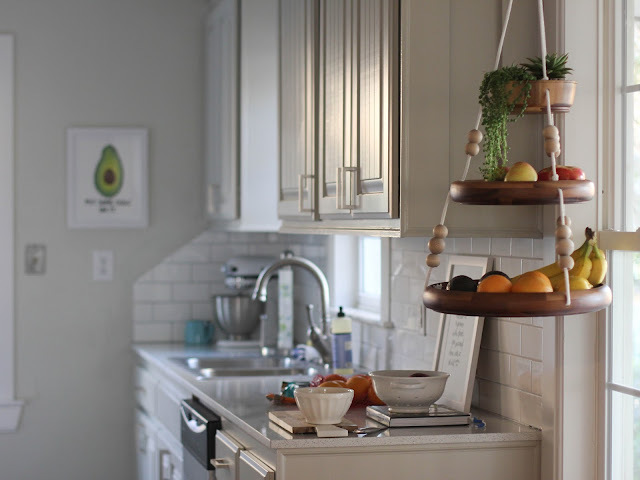 You've probably heard it a million times: Paint makes a huge difference for a small price. I'm here to confirm that statement! I am the type of person that thinks painting is a huge hassle and put it off as long as I can, but once I finish painting something I realize how far my small time commitment went and it always pays off. What is on your #homegoals list? Write it down! In october, I had about 6 things on my #homegoals list - big and small and I checked off 5 of the 6. I would say that is pretty good! And the upside is I barely spent any money, I just had to set aside time! I have a long, never ending list of things I want for our home as well as things I want to change but I ask myself what is possible now and take very small steps towards those things. Don't love that striped antique wingback chair as much as you did when you first saw it? Sell it and stash the money away for that new leather chair you want! Whether it is Craigslist, Facebook, a garage sale, consignment or eBay…there are so many ways to earn money for what you already have but aren't loving or putting to good use. A few dollars here and there really add up, just make sure you set the money aside for your home as soon as you earn it! One thing I wish I would have done is first start decorating our bedroom. Our bed and dresser are our only pieces of furniture and we love them but our room is no where near what we wish it to be. This is because the living room and kitchen have all our attention and are really what people see. I think I could have done a better job focusing on what matters to us: our room first. But now that I've realized this, it helps prioritize what comes first on our list! So make a list of what matters to you and focus on those things first. When I first realized how lofty my dreams were for our home, I also had this sense inside of me to "enjoy your home along the way." Host, have friends over, have date nights in the living room, build relationships…these are the things that make home, home. So don't get caught up in the details and things you want to change that you miss the opportunities to build your home as a place you love to be in and love to have friends and family in. 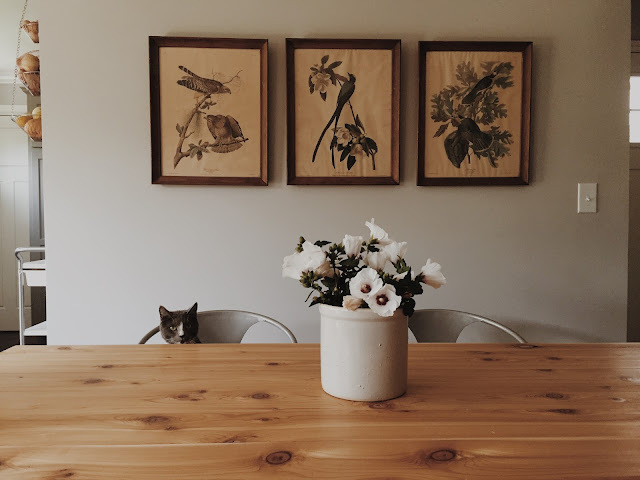 For this post, I reached out to some of my favorite bloggers and instagrammers to share their advice on decorating on a budget. I love that each one has a different style but their homes represent them perfectly! I've added links to their blogs & instagram accounts so you can go check out their spaces for yourself. I suppose my biggest advice would be to take your time. When we were first married I rushed to fill our home with pieces, and ended up with mostly things that fit the space but that we weren't in love with. Anything I have come to regret purchasing are those pieces that we sacrificed style for price. I started to take my time building what my "dream space" would look like and save up for the pieces that I really wanted. For those in between pieces that work for now but that I would love to replace one day, I hunted on craigslist. We definitely have a few gems that I found on there - again, it just takes time and (a lot of) patience! Also, be realistic! Nobody builds their dream home overnight, and nor should they! Bring things into your home that fill it with meaning, and enjoy the process of creating a space that is truly yours. A few things that I enjoy are fresh flowers, new candles, magazines, and photographs. They help make my space feel homey and warm, without needing to invest in anything crazy. When your budget is small and your decor dreams are big, you have to get creative! When decorating my home, I looked to my favorite antique stores to find unique items for a great price. I love collecting old things and finding ways to breathe new life into them. There are also a few online sources that have been useful avenues for finding affordable furniture. We found our piano for FREE on Craigslist and got our West Elm couch gently used for $400 on Facebook! All these things together have helped give my home the cozy feel that I love! My living room sofas are both from Ikea. Pretty easy on the wallet. I purchased the green velvet Stockholm sofa and after replacing the legs on it, it looks almost identical to an Anthropologie sofa that cost over $1200 more! I also purchased the Kivik sofa from Ikea but opted not to include the oversized arms it offered. I was worried it would be weird to have a sofa with no arms but I actually love it. It's still way comfy without the arms and convenient if that makes sense. The new legs on the Stockholm and no arms on the Kivik make them look a little more custom. Plus various coordinating throw pillows from your favorite stores add a lot. My kitchen cabinets are also from Ikea because the price was right but in order for it to not look like its straight up an "Ikea kitchen," I had them professionally painted and used 3 different kinds of knobs and pulls not from Ikea. "Narrow down the style you are going for with pictures that inspire you. Troll Craigslist as if it were Nordstrom's anniversary sale, to find key furniture pieces. Type in key words like retro, funky, old. (The best deals are from people who don't know what they have) A natural fiber rug, like jute, is a classic and timeless rug and not to mention inexpensive. It holds up super well with pets and children, and eventually be layered with another rug down the road. If you're working with an existing couch but hate it, try covering the bottom cushions with a great textile piece. Shibori is huge right now, and can be a total DIY or found on eBay. Thrift stores are great places to look for accessorizing your shelfies or coffee table. 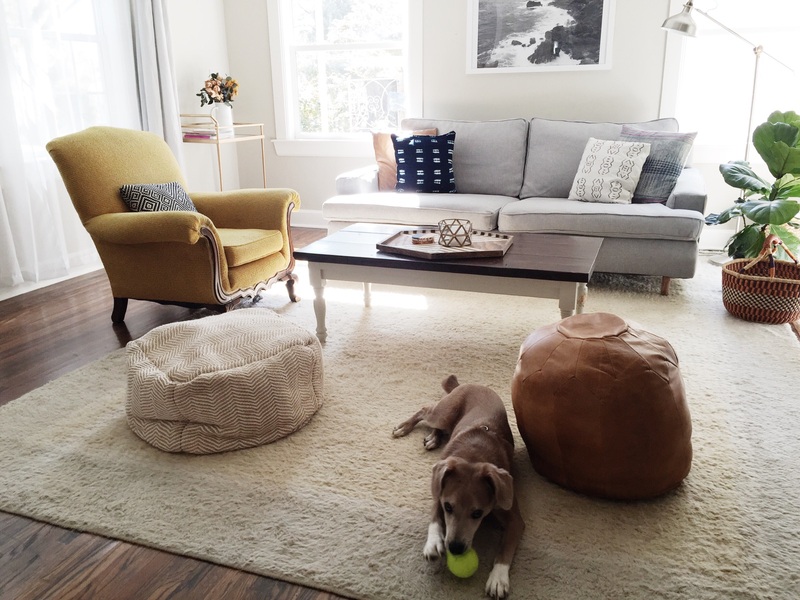 Our living room/whole house is a mix of found and new! We would love to hear YOUR thoughts on the matter. What are your favorite budget-friendly ways to make your home yours? I love cozy homes and painting things/walls is always a fun project for me. When I was younger, I painted my room from pink to grey. It was tiring but worth it! This is great advice!! Thanks for sharing, Courtney! Thanks for your input, Sallie!